Southeastern Virginia gave us a little break from the scorching heat this week as Bailey, my four-legged friend from the Norfolk SPCA, and I paid a visit to the Hickory subdivision, Viridian Reserve in Chesapeake. Bea Cobell, the Site Manager at Viridian Reserve, gave us a tour of a few of the newly constructed beautiful homes built by Etheridge Construction. Feel free to call me at 757-774-6999 with questions and to set up an appointment to get your own tour! The Claret is a brand new plan, with a design that reflects the demands of today’s homebuyer. It features an open floor plan, a thoughtful use of space, and several upstairs layout choices to make the home suit your needs and tastes. The Claret is available in Traditional, Coastal, and Craftsman elevations, with the design elements of each style reflected inside and outside the home. 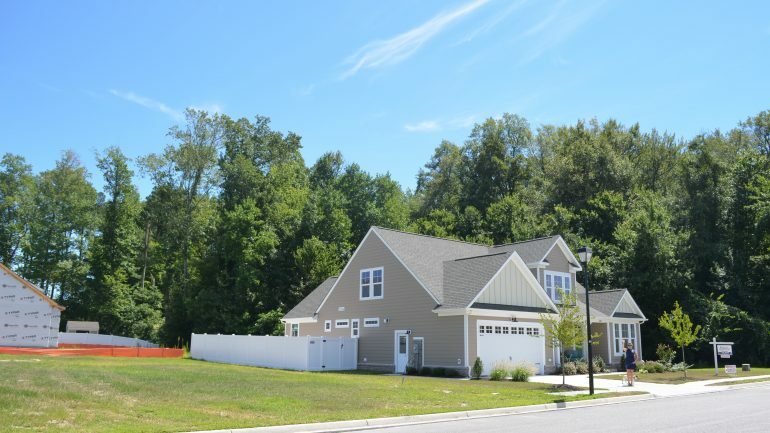 Viridian Reserve at Hickory is one of Chesapeake’s newest and most environmentally friendly communities. It consists of 165 well-located single family lots in a thoughtfully designed subdivision. Residents enjoy an unprecedented 28 acres of preserved open space, including four man-made lakes and the Frank V. Cogliandro Memorial neighborhood park. This community is conveniently located near the Chesapeake Expressway, providing quick and easy access to Downtown Norfolk, Great Bridge, Virginia Beach, the Greenbrier shopping district, and the Outer Banks of North Carolina. Etheridge Construction has over thirty years of experience in building homes that not only look great, but live well every day. Etheridge strives to focus on all the details, so that we can provide our customers a home they will love for years to come. Our family is deeply committed to building your ideal home. They operate on principles and traditions handed down through five generations. Etheridge Construction is a locally owned and family operated home building company. The company was established in 1978 by cousins Herbert Ansell and Bill Overton as a real estate development company. In the 1980s, the operation was expanded to include construction of single family homes. Herbert Ansell retired in 1997, and Scott Overton entered the business. Soon thereafter, Jeff Overton and Jeff Benson also entered the business, making it a truly family owned and operated company. Now, the next generation, Matt Benson and Josh Overton, are becoming involved in Etheridge’s new developments.